Multiplayer focused games are kind of my personal curse. When I really like the mechanics of one in particular, I tend to get really interested and excited in playing it, then, after a few weeks with it, I stop playing. It’s been like that for years, probably due to the way I play games and how they keep my interest in the long run. The Battlefield series hasn’t strayed far from that personal pattern. Starting with Battlefield:Vietnam, then Battlefield 2142, Battlefield 1943, and lastly Battlefield 3, which I barely touched. In sum: it’s hard for me to keep interest in online multiplayer shooters. And there I was attending an appointment for Battlefield 1 at EA’s showcase that took place outside of the E3 show floor space. 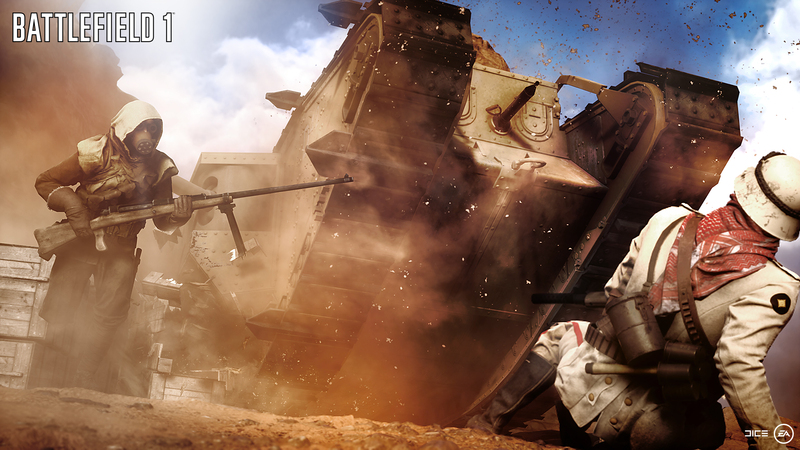 It’s now DICE’s World War I into a videogame, more precisely, a multiplayer one. While World War II has seen its surge, drop and now resurgence in games over the past 20 odd years, the very first world conflict, the Big One, has rarely been approached by videogames. Outside of Signal Studios’ excellent Toy Soldiers, which literally had us playing with tin soldier toys from WWI, and Ubisoft’s dramatic Valiant Hearts, there hasn’t been anything that significantly and realistically depicted the savage violence of that particular conflict in human history through the first person perspective, as a shooter. 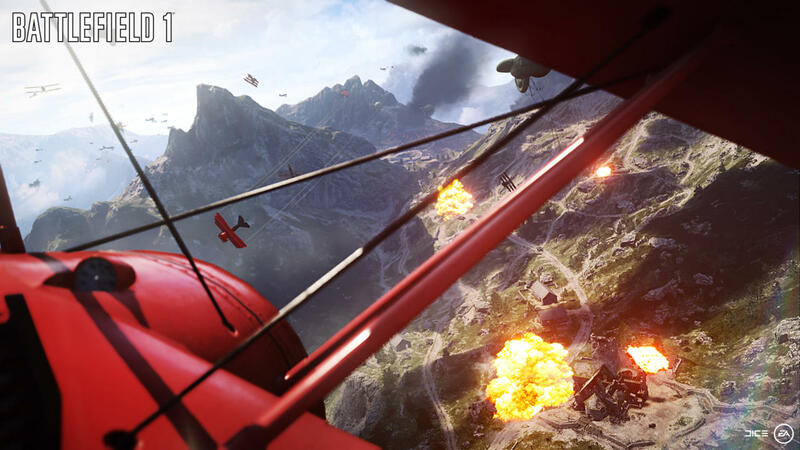 Battlefield 1 is pretty much what EA and DICE have been doing with the franchise, only in the setting of World War I, that is, huge maps, big teams, loud weapons and chaos. You can take the fight to the air as well, and try to fight it out Red Baron style, in his virtual shoes, even, if you dare. In the demo battle that took place somewhere in France, our group was split into two and we faced each other as teams with very few distinguishing features other than red fighting blue, so I wasn’t able to pick out which of the war’s sides I was playing as until I heard my own characters voice when I issued a command – I was with the allies. Those commands are a big part of ground combat, because the big deal in Battlefield 1, as with previous games, is taking over territories. These spaces are always in flux between factions, and that’s where issuing orders come into play, to help focus your team and point them towards whatever target is more close by or in danger of reverting to the enemy, for instance. Speaking of teams, each side is split into them, so you’ll always be making the rounds with a squad of people at your side. According to what was hammered at us in the intro video before the demo, sticking to your guys is paramount to success, mostly because you can teleport to them when you are offed, and by staying together as a piece of land is being taken over, you’ll do so more quickly. No news there, plenty of other shooters have done the same in the past, but given its theme and that war in particular, it makes plenty of special sense in Battlefield 1‘s case. No faction is a singular power, but a combination of smaller forces, each with their own internal struggles, considering there are sub leaders in each of them trying to carry along a fight hopefully to victory. At the top of that chain sits a general, who gives overall orders to the entire faction, similarly to what was started in Battlefield 2 way back in the mid 2000s and carried on within each subsequent Battlefield game. There’s also a turntable mechanic that comes into play very late in a match where a huge zeppelin flies over the battleground in order to lay waste to the team that’s winning the game, at which point players from the losing team can man guns, cannons and even the helm in order to turn the tide of the battle. It’s a sight to behold, surely, but it can still be shot down by the opposition, which to my surprise happened during my demo session. In all, my time with that game was spent dying more than doing any of the killing. I’m not particularly fond of simply going in and trying to murder everyone in this kind of game, so I usually try to go for objectives, which in turn, helped almost carry my faction to victory, and hell, I did put up a lot of fight along with my reluctant squad mates. It was chaos, I had my share of fun, but there’s a part of me that really wants to want and see what’s up when Battlefield 1 actually hits shelves, if that feeling of “yeah, I’m surely gonna play this” is for real or if it’s merely the pre-launch hype talking. Maybe I’ve learned with those experiences I mentioned before? Regardless of the answer, it’s safe to assume Battlefield 1 will be big and loud, at the very least. There wasn’t a moment of silence the entire time I was playing the demo, with explosions, shots and screams at every moment. In more ways than one, it really drives home the feeling of chaotic madness that that war must’ve carried, and that fighting in general must as well. A lot of games can be credited for the same, so that’s nothing unique to Battlefield 1, but I guess it’s good that it’s hitting all those notes, as a spectacle piece of its own, in an even larger scale. World War I might have been over for more than eighty years, but Battlefield 1 aims to start it all over again on October 21st.